Not to be confused with Wayne, New York or Wayne County, Michigan. Prior to the arrival of Europeans, the land Wayne County encompasses was originally part of the Iroquois Confederacy, which had existed from around August 31, 1142. 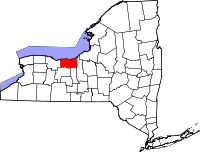 When counties were established in New York State on November 1, 1683, it became part of Albany County. While Phelps and Gorham sold some land to settlers, they were unable to make payments on their land and much of the land in the Phelps Gorham purchase either reverted to Massachusetts and was resold or conveyed directly to Robert Morris, a major financier of the Revolutionary War and signer of the US Declaration of Independence. In 1792, he in turn sold approximately 1,200,000 acres (4,900 km2) to The Pulteney Association owned by Sir William Pulteney and two other minor partners. The Pulteney Purchase, or the Genesee Tract as it was also known, comprised all of the present-day counties of Ontario, Steuben and Yates, as well as portions of Allegany, Livingston, Monroe, Schuyler and Wayne. After Pulteney's death in 1805 the land was known as the Pulteney Estate. Palmyra became the birthplace of the Latter Day Saint movement in the 1820s. Sodus Bay also was the site of a community of Shakers from 1826 to 1836. The site provided convenient access to travel by water on the Great Lakes Ontario and Erie, for visits to Shakers who lived in Ohio. This site might also have been useful for abolitionists moving former slaves to freedom in Canada via the Underground Railroad. The first Shaker leadership team, Elders Jeremiah Talcott and Eldress Polly Lawrence, along with their assistants John Lockwood and Lucy Brown, came to Sodus from the Shakers' parent community at New Lebanon, New York. With 72 converts during their first year, they soon had 200 acres under cultivation. By 1835, the community had grown to almost 150. However, they learned in 1835 that a canal had been proposed to be dug through their land, and by New York state law, the canal company had the right to seize the property it chose. The Shakers responded by selling their land and 23 buildings to the canal company and moving inland to the 1,700 acres they purchased at Groveland, in Livingston County, New York. However, the canal was never built; two years later, the Shakers were asked to take their property back, but, having reestablished their village elsewhere, and knowing that the land could later be taken for the same purpose, they refused. Several diaries and journals describing the Shakers' early years at Sodus and Groveland can be found at the Western Reserve Historical Society, Cleveland, Ohio. These manuscripts are available on microfilm at more than 20 locations throughout the U.S. The Erie Canal transits the southern edge of the county. The villages of Clyde, Lyons, Newark, Palmyra and Macedon all became homes to canal locks when the Albany to Rochester section of the canal opened on September 10, 1823. On that day these communities became part of a direct water-link between the eastern seaboard metropolises of New York City and Baltimore and America's expanding western frontier. The county seat is the town of Lyons and bi-weekly board meetings are held in the Wayne County Court House in the hamlet. In August 2010, the board made history by convening outside of Lyons for the first time—at the Wayne County fairgrounds in Palmyra. ^ McKelvey, Blake (1927). "Historic Aspects of the Phelps and Gorham Treaty of July 4–8, 1788" (PDF). Rochester, New York: Rochester Public Library. Retrieved January 7, 2007. ^ a b c Sullivan, James (1927). "The History of New York State". Lewis Historical Publishing Company, Inc. Archived from the original on January 2, 2007. Retrieved January 6, 2007. ^ a b "Williamson". Pultneyville Historical Society. 2003–2006. Archived from the original on April 15, 2013. Retrieved January 7, 2007. ^ Martin, John H. (Fall 2005). "Saints, Sinners and Reformers". The Crooked Lake Review. Retrieved January 7, 2007. ^ The current Shakers, who live at Sabbathday Lake, in New Gloucester, Maine, maintain a Shaker Library which owns this microfilm, as do many of the Shaker historical sites and a number of academic institutions. ^ "The Hoffman Foundation Scholarship Essay Program". Wayne County, New York: Office of the County Historian. Retrieved January 7, 2007. ^ "TRANSMITTAL OF NUREG-0916 RELATIVE TO THE RESTART OF R. E. GINNA NUCLEAR POWER PLANT (Generic Letter No. 82-11)". UNITED STATES NUCLEAR REGULATORY COMMISSION. June 9, 1982. Retrieved January 9, 2009. ^ "Nuclear Plant Mishap Is Explained by Utility". The New York Times. March 25, 1982. Retrieved January 9, 2009. ^ Chron4 Archived March 11, 2016, at the Wayback Machine. Webcache.googleusercontent.com. Retrieved on August 23, 2013. ^ "Wayne County, New York: County Budget". Wayne County, New York. December 16, 2006. Archived from the original on December 7, 2006. Retrieved January 6, 2007. ^ Tammy Whitacre (August 10, 2010). "FROM THE WAYNE COUNTY FAIR: Supervisors under the big top". Waynepost.com. Archived from the original on July 27, 2011. Retrieved August 24, 2010. ^ "7th Judicial District Wayne County, N.Y." New York State Unified Court System. Retrieved November 28, 2008. ^ "Town & Village Courts". New York State Unified Court System. Retrieved November 28, 2008. ^ Leip, David. "Dave Leip's Atlas of U.S. Presidential Elections". uselectionatlas.org. Retrieved October 25, 2018. ^ "NYSVoter Enrollment by County, Party Affiliation and Status" (PDF). New York State Board of Elections. November 2013. Retrieved March 18, 2014. ^ "NYS Board of Elections November 2, 2010 Governor Vote by Assembly District" (PDF). New York State Board of Elections. November 2010. Retrieved March 22, 2012. ^ a b "U.S. Census (2010) – Fact Sheet (Wayne County, New York)". U.S. Census Bureau. Archived from the original on November 29, 2014. Retrieved January 18, 2015. ^ American FactFinder, 2013 American Community Survey Demographic and Housing Estimates Archived November 29, 2014, at the Wayback Machine, Retrieved January 18, 2015. ^ "Wayne County Industrial Development Agency Home Page". Wayne County Industrial Development Agen. 2008. Retrieved March 11, 2011. ^ "The Role of Agriculture in the New York State Economy". New York State Office of the Comptroller. February 2010. Retrieved March 11, 2011. ^ "Wayne County QuickFacts from the U.S. Census Bureau". Retrieved April 18, 2014. ^ "Lyons Central School District Home / Homepage". www.lyonscsd.org. Retrieved October 25, 2018. "The Hoffman Foundation Scholarship Essay Program". Wayne County, New York: Office of the County Historian. Retrieved January 7, 2007.